Capital Market refers to the facilities and institutional arrangements for borrowing and lending ‘term funds’, medium term and long term funds. It is the market for long term loanable funds as distinct from money market which deals in short-term funds. The demand for long term funds comes from private business corporations, public corporations and the government. The supply of funds comes largely from individual and institutional investors, banks and special industrial financial institutions and Government. It deals with equities and debentures in which shares and debentures of existing companies are traded and shares and debentures of new companies are bought and sold. This market is further divided into the new issues market (Primary Market) and old capital market (Secondary Market) meaning the stock exchange. Development financial institutions were set up to meet the medium and long-term requirements of industry, trade and agriculture. These are IFCI, ICICI, IDBI, SIDBI, IRBI, UTI, LIC, GIC etc. All These institutions have been called Public Sector Financial Institutions. Financial Intermediaries include merchant banks, Mutual Fund, Leasing companies etc. they help in mobilizing savings and supplying funds to capital market. Merchant bankers are financial intermediaries between entrepreneurs and investors. Merchant banks may be subsidiaries of commercial banks or may have been set up by private financial service companies or may have been set up by firms and individuals engaged in financial up by firms and individuals engaged in financial advisory business. Merchant banks in India manage and underwrite new issues, undertake syndication of credit, advice corporate clients on fund raising and other financial aspects. Since 1993, merchant banking has been statutorily brought under the regulatory framework of the Securities Exchange Board of India (SEBI) to ensure greater transparency in the operation of merchant bankers and make them accountable. The RBI supervises those merchant banks which were subsidiaries, or are affiliates of commercial banks. Leasing has proved a popular financing method for acquiring plant and machinery specially or small and medium sized enterprises. The growth of leasing companies has been due to advantages of speed, informality and flexibility to suit individual needs. The Narasimhan Committee has recognised the importance of leasing and hire-purchase companies in financial intermediation process and has recommended that: (i) a minimum capital requirement should be stipulated; (ii) prudential norms and guidelines in respect of conduct of business should be laid down; and (iii) supervision should be based on periodic returns by a unified supervisory authority. It refers to the pooling of savings by a number of investors-small, medium and large. The corpus of fund thus collected becomes sizeable which is managed by a team of investment specialists backed by critical evaluation and supportive data. Since 1992, the Government of India has allowed foreign investment in the Indian securities through the issue of Global Depository Receipts (GDRs) and Foreign Currency Convertible Bonds (FCCBs). Initially the Euro-issue proceeds were to be utilised for approved end uses within a period of one year from the date of issue. Since there was continued accumulation of foreign exchange reserves with RBI and there were long gestation periods of new investment the government required the issuing companies to retain the Euro-issue proceeds abroad and repatriate only as and when expenditure for the approved end uses were incurred. The aim of venture capital companies is to give financial support to new ideas and to introduction and adaptation of new technologies. They are of a great importance to technocrat entrepreneurs who have technical competence and expertise but lack venture capital. Besides the above given institutions, the government has established a number of new financial intermediaries to serve the increasing financial needs of commerce and industry is the area of venture Capital, credit rating and leasing etc. (1) Technology Development and Information Company of India (TDICI) Ltd., a technology venture finance company, which sanctions project finance to new technology venture since 1989. (ii) Risk Capital and Technology Finance Corporation (RCTFC) Ltd., which provides risk capital to new entrepreneurs and offers technology finance to technology-oriented ventures since 1988. (iii) Infrastructure Leasing and Financial Services (IL&FS) Ltd., set up in 1988 focuses on leasing of equipment for infrastructure development. (iv) The credit rating agencies namely credit rating information services of India (CRISIS) Ltd., setup in 1988; Investment and Credit Rating Agency (ICRA) setup in 1991, and Credit Analysis and Research (CARE) Ltd., setup in 1993 provide credit rating services to the corporate sector. Credit rating promotes investors interests by providing them information on assessed comparative risk of investment in the listed securities of different companies. It also helps companies to raise funds more easily and at relatively cheaper rate if their credit rating is high. (v) Stock Holding Corporation of India (SHCIL) Ltd., setup in 1988, with the objective of introducing a book entry system for transfer of shares and other type of scrips thereby avoiding the voluminous paper work involved and thus reducing delays in transfers. In developing countries like India the importance of capital market is self evident. In this market, various types of securities helps to mobilise savings from various sectors of population. The twin features of reasonable return and liquidity in stock exchange are definite incentives to the people to invest in securities. This accelerates the capital formation in the country. The existence of a stock exchange enables companies to raise permanent capital. The investors cannot commit their funds for a permanent period but companies require funds permanently. The stock exchange resolves this dash of interests by offering an opportunity to investors to buy or sell their securities, while permanent capital with the company remains unaffected. The stock exchange is a central market through which resources are transferred to the industrial sector of the economy. The existence of such an institution encourages people to invest in productive channels. Thus it stimulates industrial growth and economic development of the country by mobilising funds for investment in the corporate securities. The stock exchange provides a central convenient place where buyers and sellers can easily purchase and sell securities. Easy marketability makes investment in securities more liquid as compared to other assets. An important shortage faced by entrepreneurs in developing countries is technical assistance. By offering advisory services relating to preparation of feasibility reports, identifying growth potential and training entrepreneurs in project management, the financial intermediaries in capital market play an important role. The capital market serves as a reliable guide to the performance and financial position of corporates, and thereby promotes efficiency. The prevailing market price of a security and relative yield are the guiding factors for the people to channelise their funds in a particular company. This ensures effective utilisation of funds in the public interest. The financial institutions functioning in the capital market provide a variety of services such as grant of long term and medium term loans to entrepreneurs, provision of underwriting facilities, assistance in promotion of companies, participation in equity capital, giving expert advice etc. Capital Markets provide funds for projects in backward areas. This facilitates economic development of backward areas. Long term funds are also provided for development projects in backward and rural areas. Capital markets makes possible to generate foreign capital. Indian firms are able to generate capital funds from overseas markets by way of bonds and other securities. Government has liberalised Foreign Direct Investment (FDI) in the country. This not only brings in foreign capital but also foreign technology which is important for economic development of the country. With the help of secondary market investors can sell off their holdings and convert them into liquid cash. Commercial banks also allow investors to withdraw their deposits, as and when they are in need of funds. The Commercial and Financial Institutions provide timely financial assistance to viable sick units to overcome their industrial sickness. To help the weak units to overcome their financial industrial sickness banks and FIs may write off a part of their loan. Indian capital market was hardly existent in the pre-independence times. Agriculture was the mainstay of economy but there was hardly any long term lending to agricultural sector. Similarly the growth of industrial securities market was very much hampered since there were very few companies and the number of securities traded in the stock exchanges was even smaller. 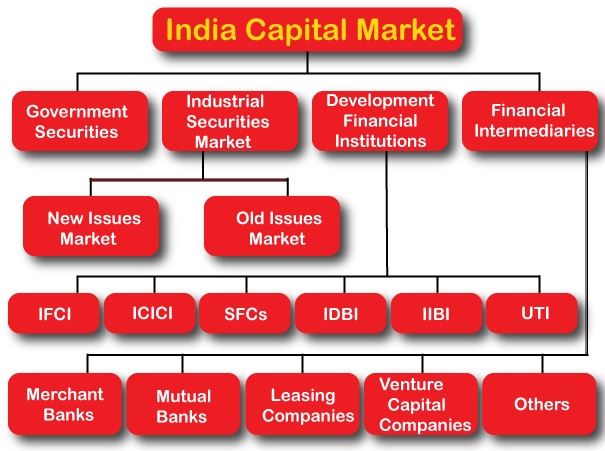 Indian capital market was dominated by gilt-edged market for government and semi-government securities. Individual investors were very few in numbers and that too were limited to the affluent classes in the urban and rural areas. Last but not the least, there were no specialised intermediaries and agencies to mobilise the savings of the public and channelise them to investment. Since independence, the Indian capital market has made widespread growth in all the areas as reflected by increased volume of savings and investments. In 1951, the number of joint stock companies (which is a very important indicator of the growth of capital market) was 28,500 both public limited and private limited companies with a paid up capital of Rs. 775 crore, which in 1990 stood at 50,000 companies with a paid up capital of Rs. 20,000 crore. The rate of growth of investment has been phenomenal in recent years, in keeping with the accelerated tempo of development of the Indian economy under the impetus of the five year plans. The securities market is regulated by various agencies such as the Department of Economic Affairs (DEA), The Department of company affairs (DCA), the Reserve Bank of India and the SEBI. The activities of these agencies are coordinated by a high level committee on capital and financial markets. 1. The SEBI Act, 1992 which establishes the SEBI with four fold objectives of protection of the interests of investors in securities, development of the securities market, regulation of the securities market and matter connected therewith and incidental thereto. 2. The Companies Act, 1956 which deals with issue, allotment and transfer of transfer of securities, disclosures to be made in public issues, underwriting, rights and bonus issues and payment of interest and dividends. 3. The Securities Contracts Regulation Act, 1956 which provides for regulations of securities trading and the management of stock exchanges. 4. The Depositories Act, 1996 which provides for establishment of depositories for electronic maintenance and transfer of ownership of demat securities. The capital market for equity and debt securities is regulated by the Securities and Exchange Board of India.